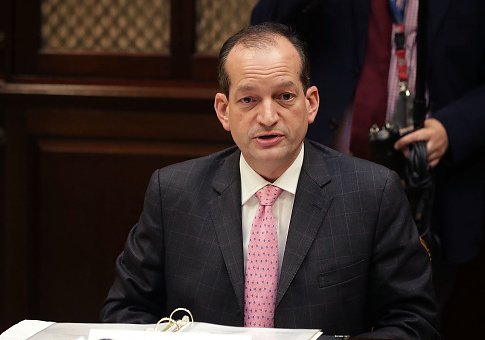 Labor Secretary Alexander Acosta wants to increase the number of apprenticeship programs by curbing the department's "cumbersome" approval process. Acosta appeared before the House Committee on Education and Workforce on Wednesday to highlight the department's agenda heading into 2018. He emphasized its commitment to expanding apprenticeship programs for young and entry-level workers to learn a trade, praising union led programs in the building trades, including the steamfitters and pipefitters and carpenters unions, as well as industry-led apprenticeship programs at Ford and Boeing. Both former President Barack Obama and President Donald Trump pledged to boost federal funding for programs in the private sector, as well as community colleges. However, Acosta said the growth of apprentice enrollment has not matched expectations and that America still faces a skills gap, claiming more than 6 million jobs are left unfilled because of the lack of qualified candidates. Acosta said the problem stems from the fact that federally registered programs "are not scaling at the rate they could grow." He cited regulatory red tape as one of the obstacles to the spread of apprenticeship, which only makes up 0.3 percent of the workforce. "The regulatory approval process is viewed as cumbersome … it takes a long time. An individual or a company that is interested, let's say having 30 or 40 apprenticeships, by the time they look at the registration process…they're making a calculus that they shouldn't engage at all," Acosta said. Even after registering with the Labor Department, program leaders must also win the approval of state authorities, which have varying degrees of requirements in credentialing. Acosta chairs the Task Force on Apprenticeship Expansion, which met for the first time on Monday. The task force, created by a Trump executive order in June, is made up of employers, business leaders, and other policymakers. He has made it a priority to expand access for private apprenticeship systems, pointing to the building trades as a model. Industry and union groups have invested $1 billion to create 1,600 training centers across the country. "We are looking to develop a system that can streamline the certification process, that in essence would be flexible and would really depend industry by industry," he said. Rep. Susan Davis (D., Calif.) responded to Acosta's call for a streamlined process by saying government has a role to play in protecting workers from bad actors—the impetus behind the registration requirements. She contrasted that approach with Switzerland's apprenticeship system, which features heavy government involvement. "It was clear to us that while the industries lead the programs that there is government involvement in establishing the prestige and the quality of apprenticeships," she said. "I hope you will be open as well to how we integrate that … because we do need to have that overarching role" for the federal government. Acosta said the Labor Department will monitor apprenticeship programs to ensure quality training that provide credentials for young workers, as well as focusing on making it "portable" from locale to locale. The department's main challenge will be "to recognize the advantages of registered, but also recognize that there is room for other models." "We're a large nation and a diverse nation and there is room for a variety of programs," he said. The program laid out by Acosta won the support of business groups. Rob Gifford, executive vice president at the National Restaurant Association Educational Foundation, said the industry is exploring the formation of the first national apprentice program for those entering the food industry following the administration's call for new programs. "Secretary Acosta continues to highlight the importance of improving apprenticeship programs across sectors, including the restaurant industry," Gifford said in a statement. "Apprenticeships play a crucial role in fostering career opportunities through on the job workforce training and development." This entry was posted in Issues and tagged Alexander Acosta, Department of Labor, Secretary of Labor. Bookmark the permalink.